Brussels sprouts don’t get any better than this! Not just roasted, but crusted! Crusted with Parmesan cheese and a spark of lemon! Preheat oven to 375 degrees. Line a large, rimmed baking sheet with non-stick aluminum foil. Spray with cooking spray. Combine flour, salt and black pepper in a large bowl. Combine eggs and lemon juice in a second large bowl. Combine 1 1/4 cups Parmesan cheese and lemon zest in a third large bowl. 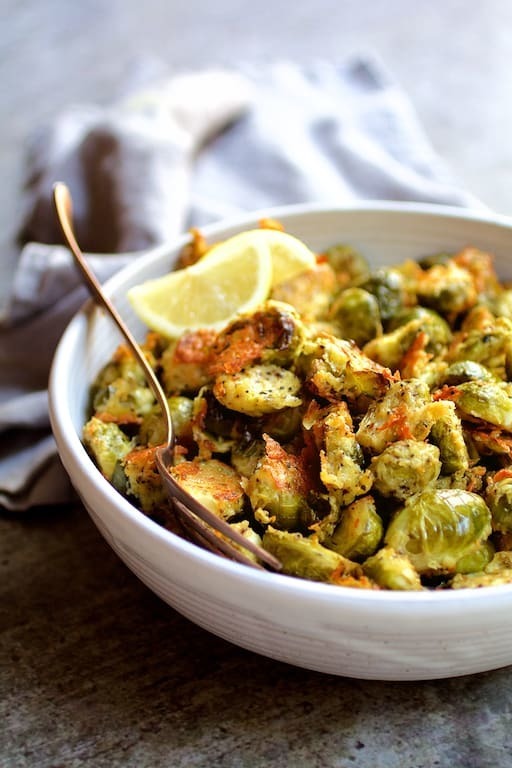 Toss Brussels sprouts in the seasoned flour, shaking off excess, coat well with egg mixture, then toss in the Parmesan cheese/lemon zest combination. Spread out on a baking sheet and top with remaining Parmesan cheese. Roast for 30 to 35 minutes or until sprouts are tender and the cheese is golden brown and crusty. Season with additional salt and black pepper if desired.